On Tuesday, October 29, all candidates for Rockville Mayor and Council participated in a debate sponsored by the Rockville Senior Citizens Commission, at the Rockville Senior Center. 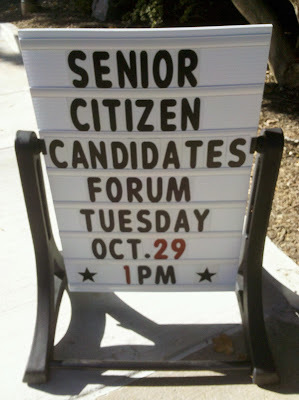 The senior center itself is a reminder of the issues at hand in this election. Like several other public sites in Rockville (the Rockville Swim Center and Montgomery College, to name a few) the Senior Center property is designed to give the impression that one is surrounded by woods. 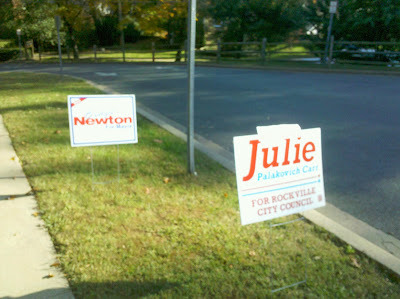 What percentage of voters identify with Rockville as a suburban town, and how many want it to take on an urban feel? The city's Adequate Public Facilities Ordinance remains a hot button issue, as does the issue of debt load vs. easy financing of public projects. Mayoral candidates Bridget Newton and Mark Pierzchala went first. Both cited their accomplishments in their current terms as city councilmembers. They again clashed on the merits of the Fireside apartments deal. On the APFO, Pierzchala made very clear that he wants it weakened, calling it "insufficient" for the city's current needs. He also promised to visit every group or organization in Rockville "within a year of being Mayor." "I am the budget guy," he said. Newton countered: "Mark might be the 'Budget Guy,' but I am the fiscal conservative." Perhaps alluding to contentious exchanges between citizens and councilmembers at recent public hearings, she said "respecting every person is how we do things in Rockville." In the council debate, most questions related in some way to Rockville's senior population. 1. 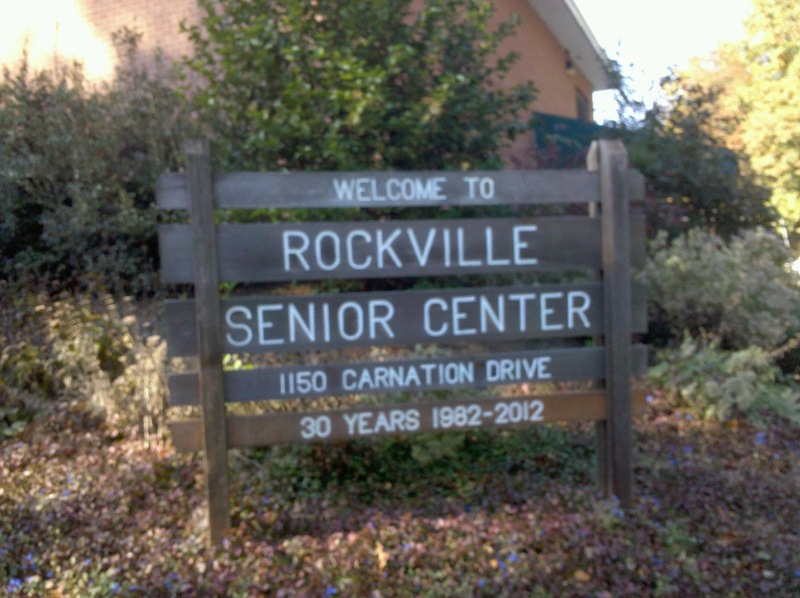 WHAT IS THE MOST IMPORTANT ISSUE FOR ROCKVILLE SENIORS? Virginia Onley said federal cutbacks, tough economic times and healthcare costs. Julie Palakovich Carr said it was the ability to stay in one's home. Don Hadley concurred that remaining at home as long as possible, and the general quality of life, were the largest issues. Councilmember Tom Moore noted that Social Security will be a worry. He said that senior programs are important because they "do more than anything else we do" to impact and improve seniors' lives. Beryl Feinberg said "linkage" of seniors to available services would be critical, as well as affordable housing. Claire Marcuccio Whitaker hoped the city could have a program to train volunteers to work with seniors, and offer a senior rewards program on purchases made in the city. 2. IF THE SENIOR CENTER LOSES FEDERAL FUNDING FOR ITS ENGLISH AND CITIZENSHIP COURSES, SHOULD THE CITY FUND THEM DIRECTLY? Whitaker called for a better online system to alert residents to Senior Center events "in multiple languages." Onley advocated for "mandatory English classes." Hadley said the question assumed no other private grant money was available, and that he would want to pursue that option before using taxpayer funds. Hadley said 5-6 stories were more than enough to allow growth and economic development. He said seniors should be able to stay involved with city activities, not be placed in isolation. "I don't relish being sent off to the farm," he noted. He also argued that there was no justification to give developers so many incentives to build. Whitaker said the Pike Plan is a developer-driven document, and said that the "leaders of Rockville should take charge - we should develop our own Rockville Pike Plan." When she added that "we could tell the developers what to do," not the other way around, an audience member shouted, "Hear, hear!" in agreement. Palakovich Carr said mixed-use development, wide sidewalks, and new retail would be advantageous for seniors. She called for a balanced approach and transit-oriented development. On the APFO, she echoed Pierzchala, saying the city must be "realistic evaluating if those laws are working properly." The current APFO will stop Phase II of the Town Center if it is not changed, she argued. Onley said the APFO should be a "guide tool, not an instrument that we put to bed and come back to in five years." She said the city should do what's best for itself, "not what we see in other jurisdictions." If pedestrian safety is not the top priority on the new Pike, "it's just gonna be like it is today," she warned. Moore cited the inability of the Rockville Volunteer Fire Department to sell its property under the current APFO restrictions. 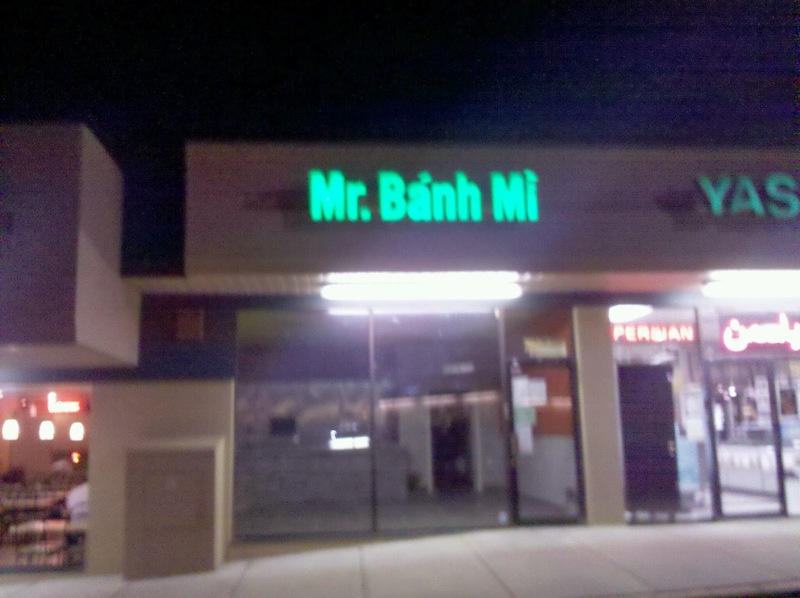 He predicted the APFO would cause Town Center Phase II to "die on the vine." "I don't think Town Center II is going to die on the vine," countered Whitaker. "That's a pretty Draconian statement," she added. Whitaker argued that Town Center II is actually in line with the original plan, and that the number of units in the future Duball, Brightview and Kettler buildings will already have exceeded the residential units called for in the master plan.She said she views Brightview's low density, senior residents, and children's playground as positive additions to Town Center. Feinberg said she favors the Pike Plan, and more dining and "gathering places." She said she is concerned about a potential lack of handicapped parking, and parking that is behind or under buildings, rather than accessible to the businesses' front doors. "I don't know what our debt is," Onley said. Whitaker used the opportunity to illustrate that she did know the figure, and argued the city should have used its recent surplus to pay down debt. She again cited Gaithersburg's $0 debt, and $65 million in the bank, as a model for Rockville. Moore diagreed, citing a 5¢ Gaithersburg tax increase. He and Feinberg both said the city's debt was well below the recommended limits. Carr noted the city's AAA bond rating, and said "there are times when it makes sense to borrow." Hadley said obligations have to be taken seriously, pointing to a new legal change that could put the city on the hook for $22 million for an employee retirement short fund. Their are no polls to tell us who's ahead. And, if county elections are an indicator, voters don't seem too concerned about debt and fiscal matters. This election may end up turning on the APFO and development issues. My thought is, it was a mistake to try to change the APFO in the weeks prior to the election. That stirred up a unneccessary hornet's nest of response among residents, which could be a tremendous weakness for the Team Rockville slate of Pierzchala, Moore, Onley, Palakovich Carr and Feinberg, if turnout is 17% again. The reason is, there is a large public opposition to weakening the APFO, amply demonstrated at the recent public hearing on the matter. Newton, Hadley and Whitaker have clearly indicated they want to take a lower-density, more suburban-scale approach to future development. That gives them an electoral base. And one that is energized, as a result of the APFO dispute, and the Pike Plan that citizens overwhelmingly have opposed in public testimony, but keeps lumbering forward anyway toward approval. The flip side of that is: What is the constituency in Rockville for high-density urbanization of the city, more traffic and more crowded schools? Are there actually significant groups of voters who want tall buildings looming over their homes? "You can count on me to resist uncontrolled, mindless growth," Whitaker promised in her closing statement. To people stuck in traffic every day, Hadley's observations that "we're busting our belt with schools and traffic" are compelling ones that resonate in reality. But without polls or intense media coverage, we simply have to wait until Tuesday night to find out which concept of Rockville's future voters want. 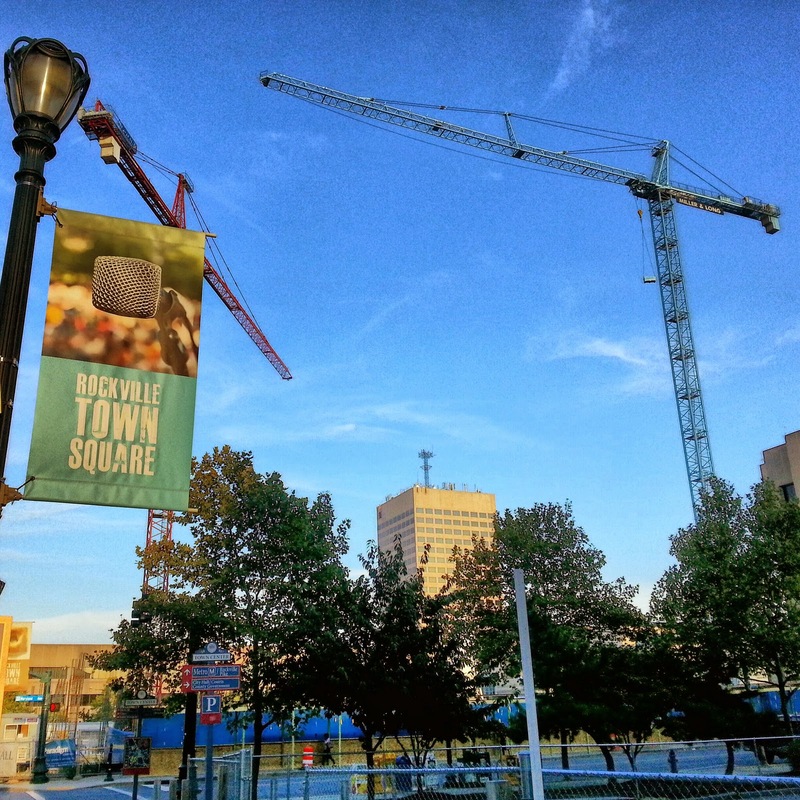 Residents in the vicinity of Rockville Town Center could be in for a rude awakening in the coming months. 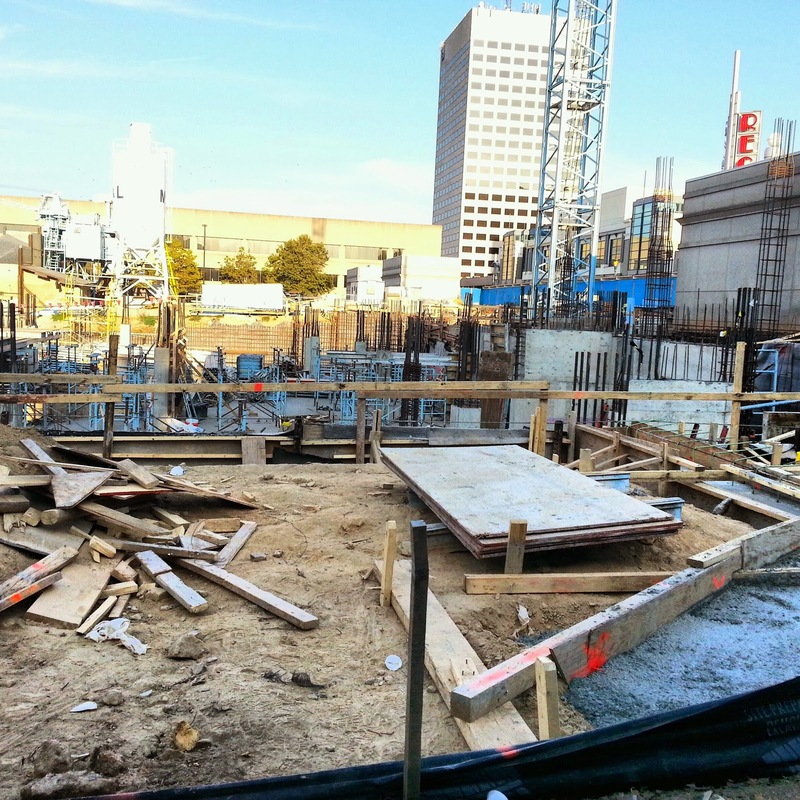 Tompkins Builders of Washington, D.C. has requested a nighttime noise waiver from the Montgomery County Department of Environmental Protection, pending approval. If granted, the contractor will be demolishing the existing roof and skylight of the existing Courthouse, and performing miscellaneous site work around the new annex exterior on Maryland Avenue, as well as at the existing Judicial Center plaza structure. 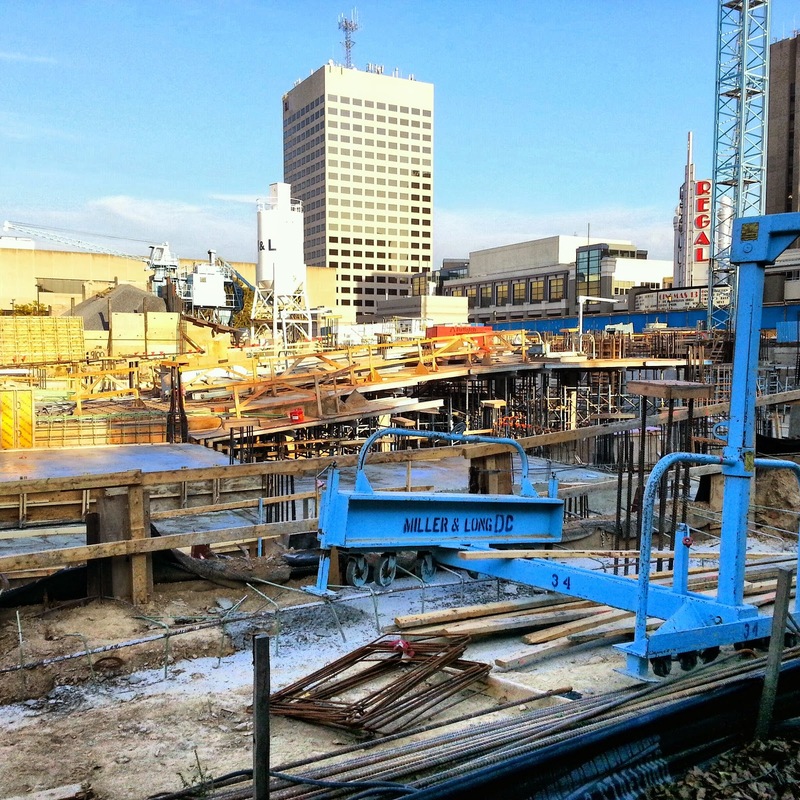 The work will primarily take place overnight on weeknights, and run through February 2014. The Rockville Mayor and Council made short work of a prominent historical designation question at last night's meeting. Councilmembers John Hall, Bridget Newton and Mark Pierzchala voted to declare 628 Great Falls Road historic. Mayor Phyllis Marcuccio and Councilmember Tom Moore voted against the motion. This was the final meeting scheduled before the November 5 city elections, in which all but Marcuccio and Hall are running. The next Mayor and Council meeting will be held November 18. 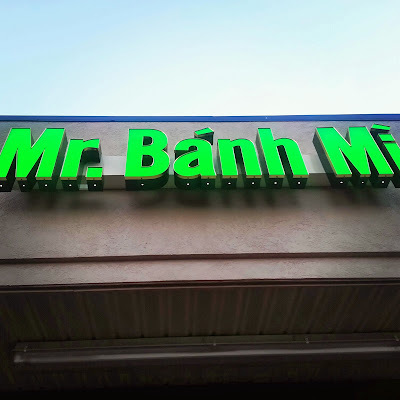 The future Mr. Bánh Mì in the Ritchie Center on Rockville Pike now has its lighted sign installed over the restaurant storefront. 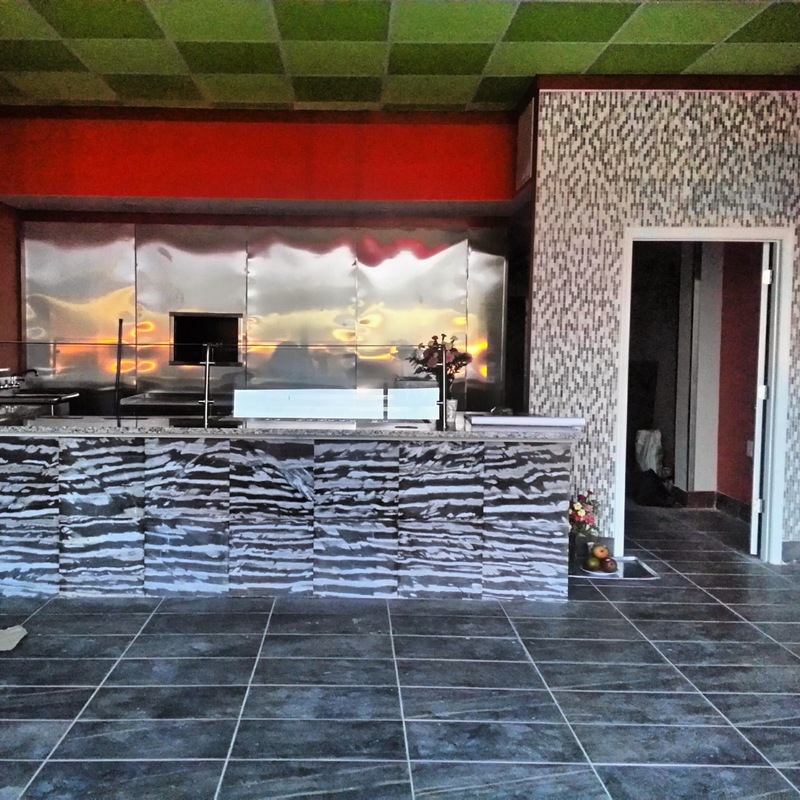 You can also see the gleaming new counter and interior. 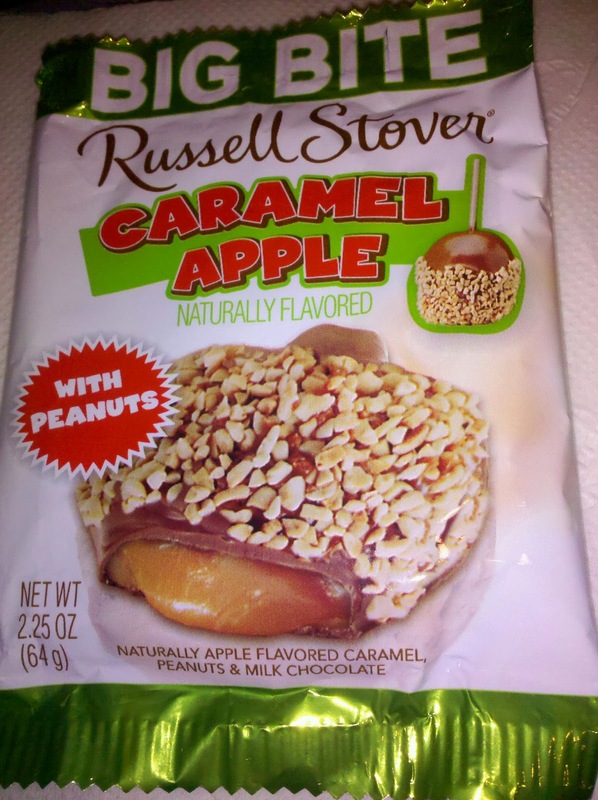 If you go trick-or-treating in Beverly Hills, or the Hamptons, you might find a Russell Stover Big Bite Caramel Apple with Peanuts in your bag. If not, you'll just have to settle for watching my review. Subscribe to my YouTube channel, and you won't miss any of the Halloween Countdown between now and October 31! Searching for Halloween beverages? Jones Soda has several, including an orange-tinted Candy Corn Soda. Watch my review to find out if it's refreshing enough for your Halloween bash (or just to drink during horror movie marathons). I found this soda at Target in Rockville. 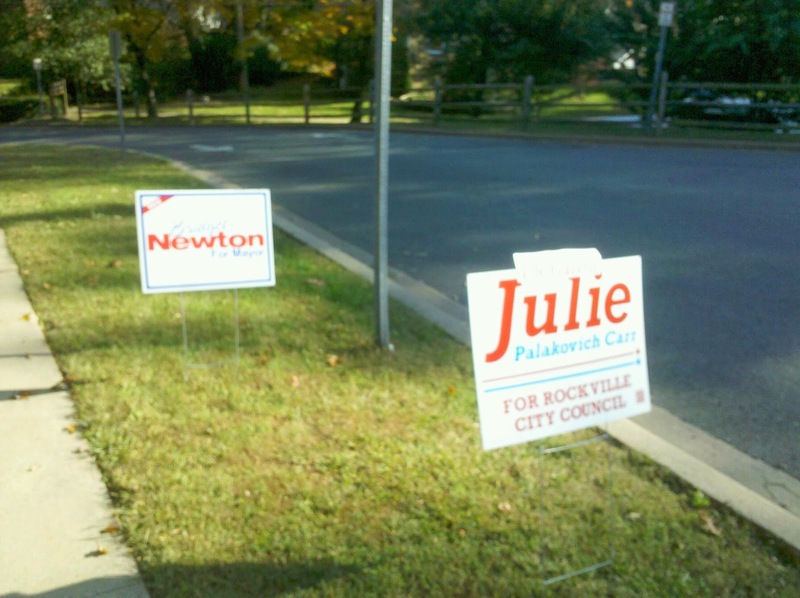 If you were tuning in for drama, zingers, and contentious bickering, you were very disappointed by the end of the Rockville City Council debate hosted by the League of Women Voters. No political careers ended, and every candidate came across as qualified and prepared to serve on the council. 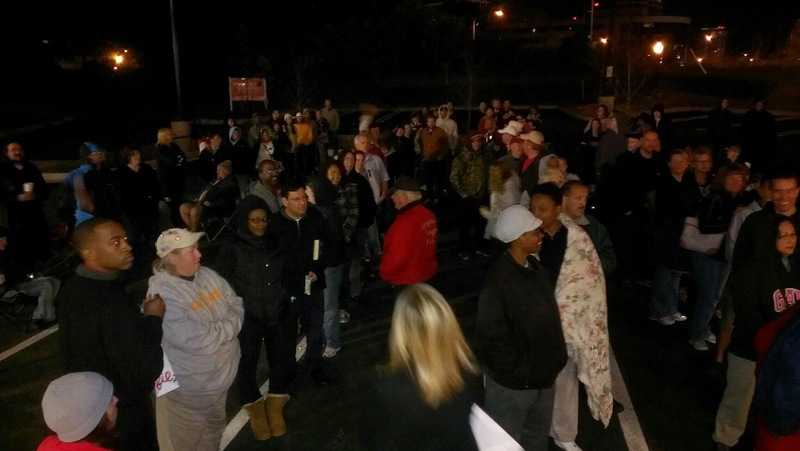 With no knockout blows landed, Rockville is headed for a turnout-based election. Having a slate in Team Rockville, and needing a 3-vote majority to steer the city's direction, the factions are clearly defined. 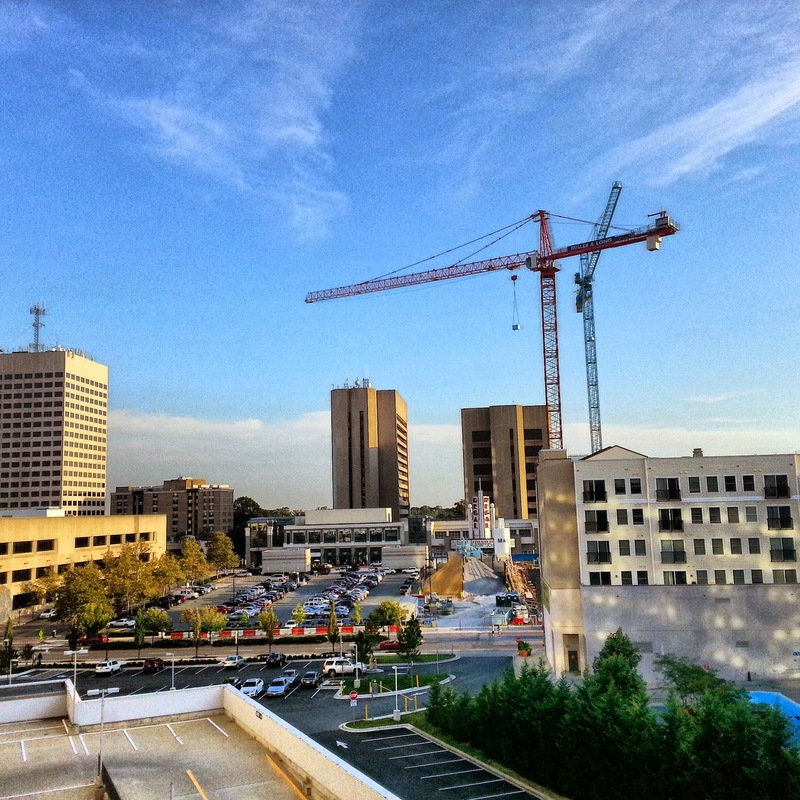 Those who favor higher-density development, and a higher rate of population growth in the city, will tend to favor Team Rockville (although not every member of Team Rockville has the same position on building heights, or what changes he or she would favor in the city's Adequate Public Facilities Ordinance). And those concerned about building heights, traffic impacts, and other effects of dense urbanization, will likely back the unofficial slate of Bridget Newton (for mayor), Don Hadley and Claire Marcuccio Whitaker. Which faction can turn out their folks on election day? That is the big question. Hadley and Whitaker have clearly become more comfortable with each debate, after entering the race at the last minute to deny Team Rockville an unopposed sweep. Both were on message on their primary agenda points in consecutive televised debates: opposition to a dense urbanization of Rockville, and concern over the city's finances and debt. 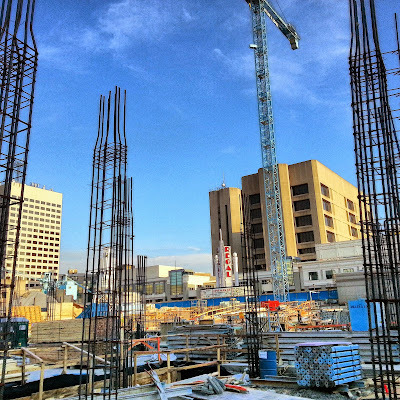 Councilmember Tom Moore offered a different perspective, citing the benefits of bond-funded construction of city facilities. Moore also scored points with longtime city residents with his brief anecdote noting his grandmother's lengthy service as a scheduler at the city's senior center. A minor point, but one that can carry weight in a municipal election. Beryl Feinberg had her best performance at this debate. The question regarding how candidates would protect the city from future economic downturns was tailor-made for Feinberg, who has spent years working on budgets for Montgomery County. Just as Virginia Onley was effective on housing in the Twinbrook debate, I think voters came away from this one associating Feinberg with budgetary experience. (Of course, depending on a voter's opinion of the county budgets of the last few years, that could be a plus or a hindrance). Onley did well, as did Julie Palakovich Carr. Carr emphasized again her experience on the city's APFO review commission, which required consensus-building among stakeholders with often opposing interests. Feinberg, Onley and Carr express independent views often enough that - while Team Rockville supporters will vote the slate - it will be interesting to see which TR members are the choices of those backing Hadley and Whitaker. Carr has repeatedly declined to take a position on the controversial ballot questions, for example. In contrast, Moore has dedicated much of his allotted speaking time to strongly urging his constituents to vote for 4 year terms, and to hold city elections in presidential years. And Feinberg, Onley and Carr have made comments throughout the debates that suggest they favor less density and height in future development than Moore and mayoral candidate Councilmember Mark Pierzchala. Caramel Apple is the new Pumpkin Spice this fall. 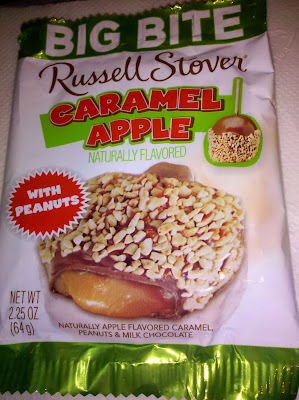 Get ahead of the trend by watching my review of Milky Way Caramel Apple Minis candy. Our esteemed expert makes an appearance, and there is a surprise in store later in the video worth tuning in for! If you like Halloween as much as I do, make sure to subscribe to my YouTube channel, and you won't miss a single episode of the Halloween Countdown. Entenmann's has the perfect donut for fall: classic Cider Donuts, available for a limited time. Are they worth picking up at the grocery store? Watch my review, and find out. Rockville's Planning Commission will continue to discuss, and update, the draft version of the Rockville Pike Plan during a worksession at its next meeting on October 23. The meeting will begin at 7:00 PM in the Mayor and Council chambers at Rockville City Hall. Also on the agenda, is a discussion of possible Mayor and Council changes to the city's Adequate Public Facility Standards (APFS), under Old Business. The Rockville City Council found that a property at 628 Great Falls Road merits historic designation Monday night. A long-simmering controversy over a single family home, and the possible expansion plans of its owner, Rockville Maryland Congregation of Jehovah's Witnesses, has generated more historical findings at every turn. The most compelling argument has been the discovery that the property was part of an African-American kinship community located around today's I-270/Falls Road interchange. Among citizen groups backing historic designation were the West End Citizens Association, and the Rose Hills Falls Homeowners Association, led by former mayor Jim Coyle. Those opposing historic designation said the bar has to be very high to designate a property over the owner's objections. Councilmember Tom Moore said he felt that bar was not met in this case, and quoted his colleagues' past statements expressing unease over such hostile designations. Mayor Phyllis Marcuccio responded that her vote would be consistent with her strong belief in property rights, saying once those rights are violated, what rights does a person have? Councilmember Mark Pierzchala made a motion in favor of historic designation, and it was seconded by Councilmember John Hall. After some discussion, Pierzchala's motion passed, 3-1-1. Pierzchala, Hall, and Councilmember Bridget Newton voted in favor of the motion. Moore voted against it, and Marcuccio abstained. The unique building at 255 N. Washington Street, known as "The Pink Bank," is now almost certain to be demolished. 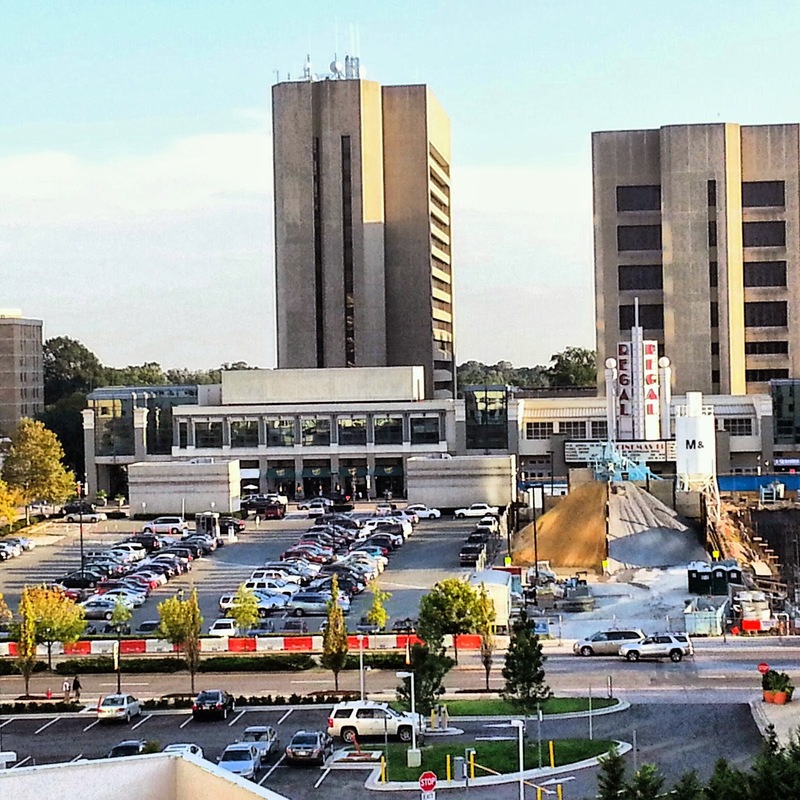 A bid to forestall demolition, via a possible historic designation process, failed at last night's Rockville Mayor and Council meeting by a vote of 2-3. Councilmembers Tom Moore and Mark Pierzchala voted to allow the study of historic designation. Mayor Phyllis Marcuccio concurred with Councilmember John Hall's assertion that such a process would waste people's time, because neither would support historic designation in the end anyway. Moore responded that both officials - and possibly himself - would be out of office by the time such a vote would be taken. Councilmember Bridget Newton also voted against the motion. 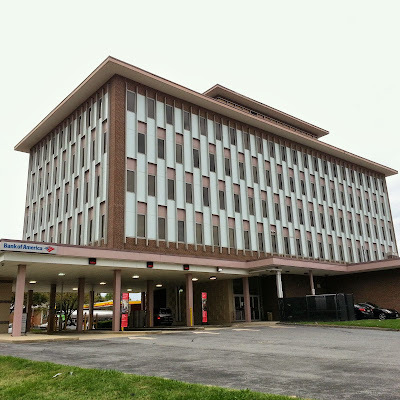 Originally the Suburban Trust bank building, it was built in 1965 and designed by architect Arthur Anderson. Some interior office space was reconfigured by another prominent Rockville architect, John Sullivan. Its singular design is an example of New Formalism, and I'm not aware of another example of it in the city of Rockville. I agree with the comments of Rockville Historic District Commissioner Jessica Reynolds, who contrasted the landmark Pink Bank with the majority of today's Montgomery County architecture, which "all looks the same: cookie cutter." Reynolds made the motion to recommend starting the historic designation process, which passed unanimously at the HDC's September meeting. 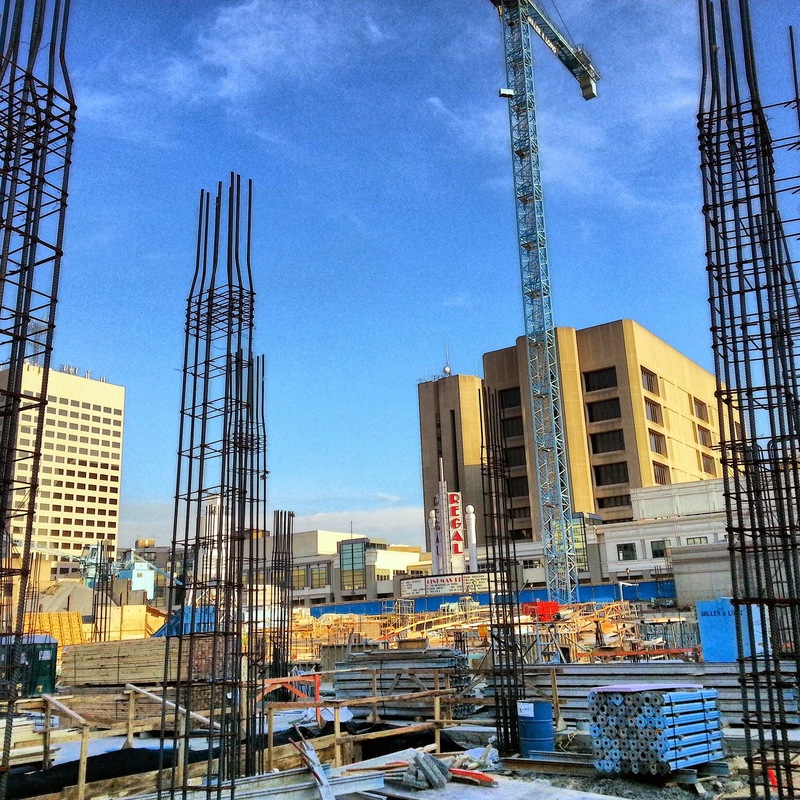 Most of today's new buildings could be anywhere. This stands in stark opposition to developers' claims that dense urbanization of the suburbs will establish a "sense of place" they somehow believe is lacking in decades-old suburban neighborhoods. 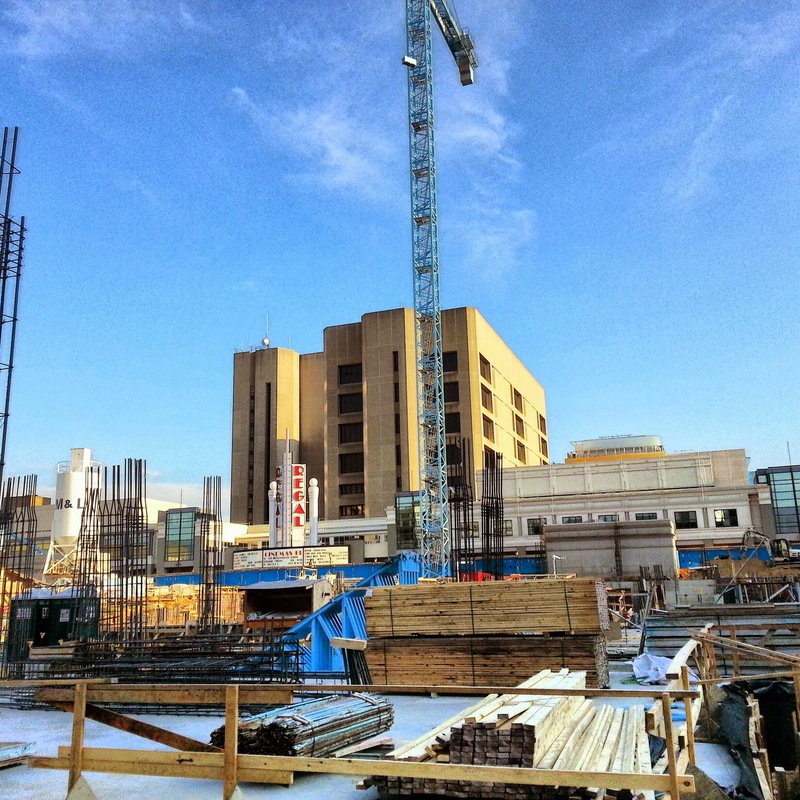 As HDC Chair Craig Moloney said, we are too quick to "throw our buildings in the dumpster." Vehicle burglary. 700 block College Parkway. Assault. 00 block Rice Court. Theft. 00 block Anamosa Court. Theft. 2100 block Baltimore Court. Assault. 200 block Richard Montgomery Drive. Assault. 400 block Summer Garden Way. Theft. 10000 block Darnestown Road. Vehicle burglary. 800 block Azalea Drive. Theft. 1100 block Seven Locks Road. Theft. 00 block Research Court. Vehicle burglary. 14300 block Stonebridge View Drive. Burglary. 200 block Currier Drive. Vehicle burglary. 600 block Northcliffe Drive. Theft. 00 block W. Montgomery Avenue. Vehicle burglary. 00 block W. Jefferson Street. Vehicle burglary. 2100 block Chapman Avenue. Assault/"other sexual offense." 7300 block Calhoun Place. Theft. 9600 block Gudelsky Drive. Theft. 600 block Warfield Drive. Theft. 600 block Lofstrand Lane. Vehicle burglary. 500 block Monet Drive. Vehicle burglary. 5900 block Vandegrift Avenue. Vehicle theft. 5600 block Fishers Lane. A civil debate produced virtually no heated moments in Twinbrook last night. Mayoral candidates Bridget Newton and Mark Pierzchala (both current Rockville city councilmembers), and council candidates Julie Palakovich Carr, Beryl Feinberg, Don Hadley, Virginia Onley, Tom Moore, and Claire Marcuccio Whitaker answered questions prepared by the Twinbrook Civic Association. The forum was moderated by former Maryland delegate Cheryl Kagan. In my personal, subjective opinion, the debate was not a game-changer for any candidate. No one hurt themselves, no one sounded unqualified to serve, but neither did anyone score sufficient points to change the dynamic of the race. The three candidates who did the best job of conveying a compelling argument for election Thursday evening (again, in my opinion), were Hadley, Onley and Whitaker. Hadley has been an intelligent, deliberative member of the Rockville Planning Commission, and currently chairs that body. His remarks in the second debate emphasized having an inclusive process and discussion as the city confronts major development pressures inside and outside its borders. Some in the city are "moving too quickly" to embrace a dense urbanization model for development in Rockville, Hadley said. There are "questions that have to be answered, before we rush into this lock, stock and barrel," he suggested. 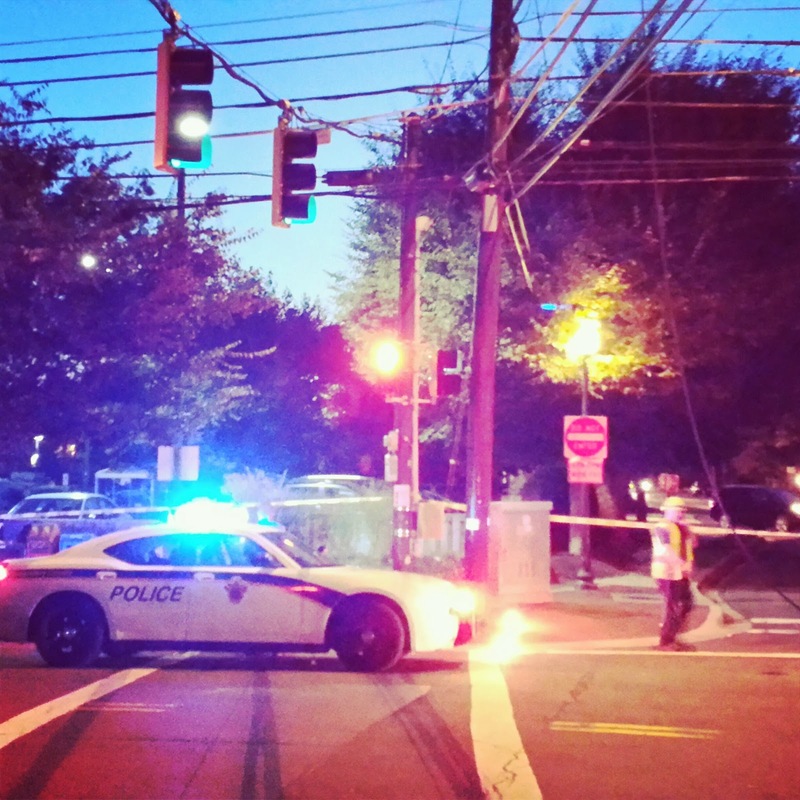 One of the biggest questions is traffic congestion, and Hadley acknowledged that, despite the work of the Planning Commission, congestion would remain a problem if the Rockville Pike plan passes. 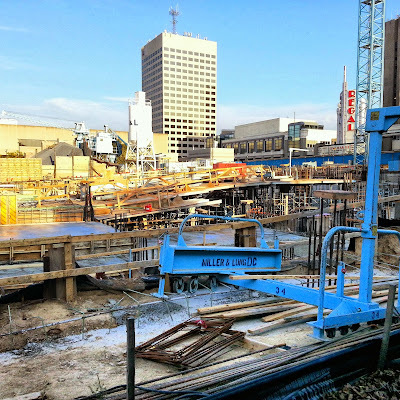 He noted that the proposed Montgomery County Bus Rapid Transit line for Rockville Pike would have only two stops, and therefore not be a viable system for actual residents. Hadley also mentioned the issue of diversity in city outreach, suggesting Latino and Asian residents were under-represented on the council, in development discussions, and even in the debate audience. This was an important topic to raise, as this is a major problem countywide. 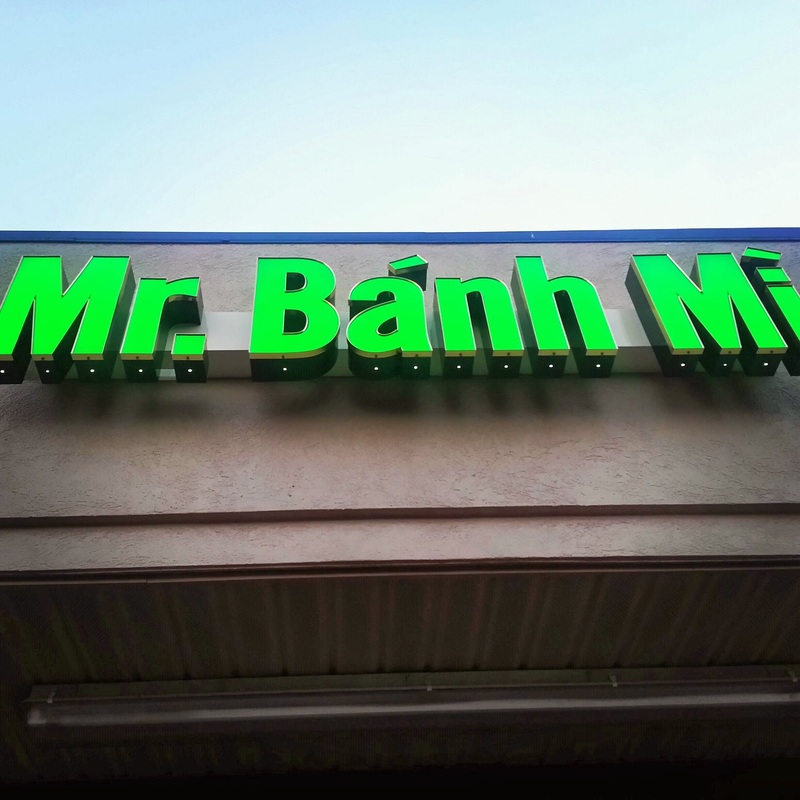 Many of the areas targeted for "infill development" or redevelopment are currently home to large numbers of residents for whom English is a second language. Therefore, many are not even aware that proposed zoning changes and master plans could force them out of their current homes and businesses. 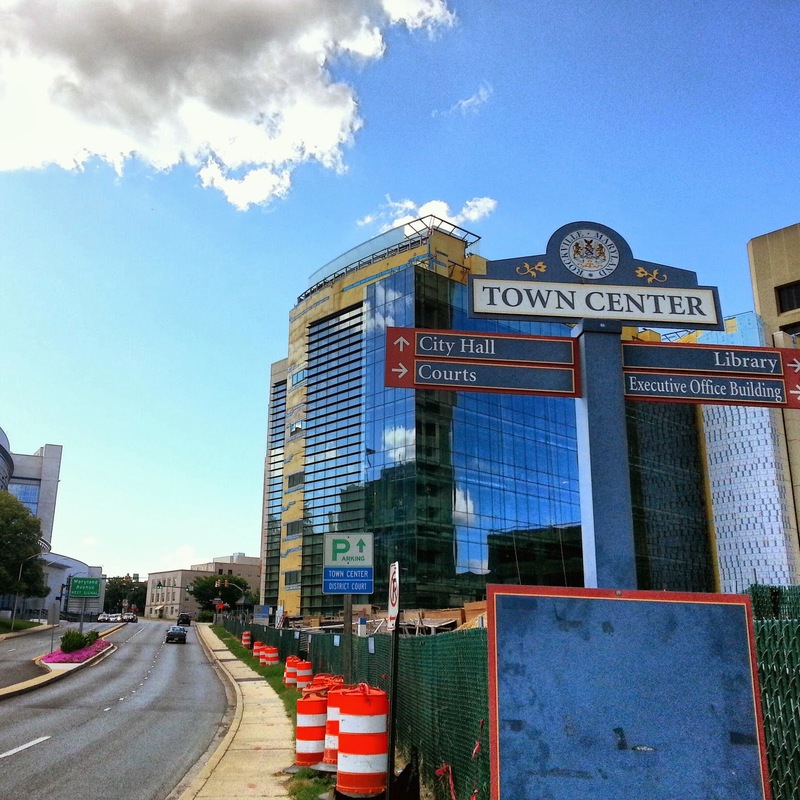 One Rockville official told me he regretted the lack of successful outreach to Latino residents in areas like Twinbrook, despite the efforts made in that direction. Finally, while some proposals seem to gain traction at the council level despite majority opposition among voters, Hadley promised a different approach. "I don't want to preach to the public; I want to listen," he said. Onley was effective in highlighting the incredible challenge of affordable housing facing the city. 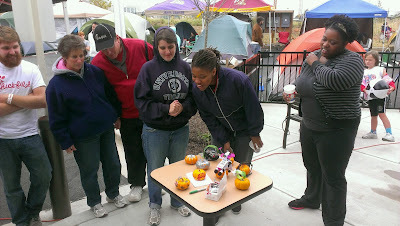 It was an opportunity to capitalize on her relevant experience with Rockville Housing Enterprise. She expressed pride in the $32 million mortgage that protected 236 residents at the Fireside Park apartments from large rent increases, calling it a "win-win" for the city. Moore concurred, calling it "our finest moment...one of the things I'm most proud of" in his first term in office. The other strong point of Onley's case was having compelling statistics to round out her case. She noted a affordable housing opportunity recently drew 5000 applications for RHE. 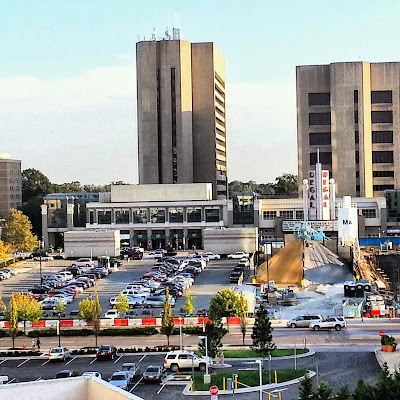 Recently, architect and urbanization advocate Roger Lewis told the Rockville Planning Commission to pass a Pike plan that would permit dense development in Rockville. 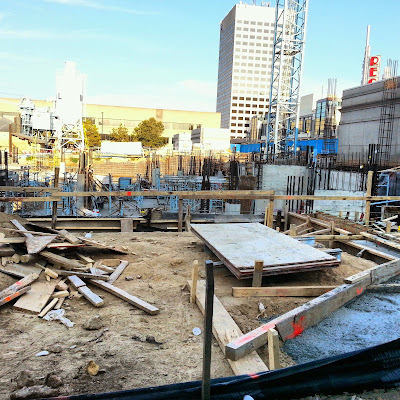 Yet, just a few months ago, Lewis acknowledged in his Washington Post column that the current Smart Growth Juggernaut will not provide the amount of affordable housing he and other advocates had previously claimed. In substantive terms, Onley said she would oppose fee-in-lieu arrangements that would allow developers to buy their way out of minimum affordable housing requirements. 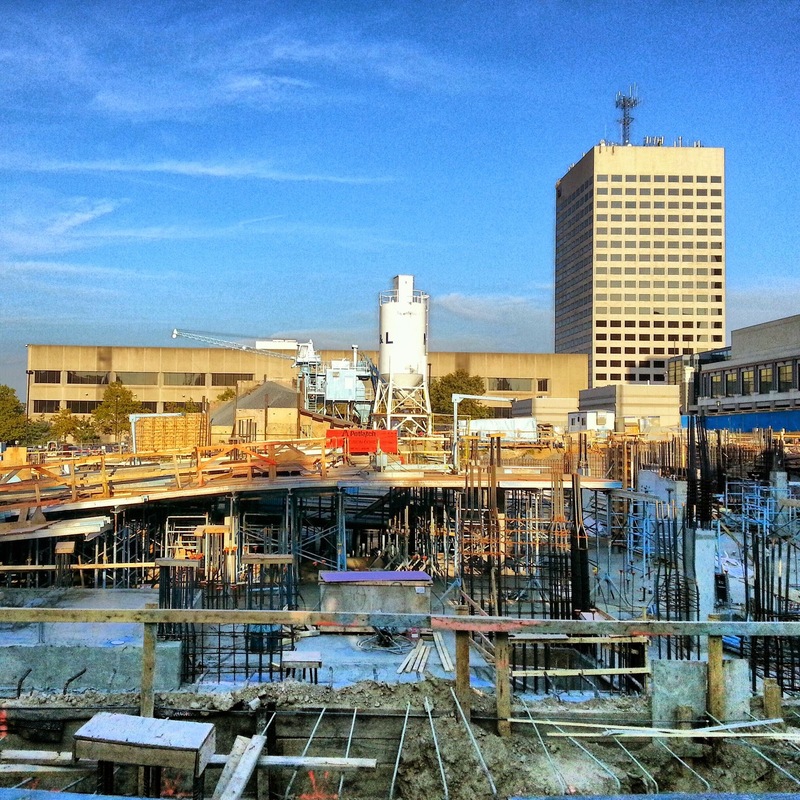 Whitaker made an effective argument for caution in plunging into urbanization of the city. With two phases of White Flint development creating 9600 units apiece, Whitaker said, more than 30,000 new cars would be brought to Rockville Pike. Only a small percentage of those new residents will drive, she said. Whitaker also made a good point on the city's finances. She cited Rockville's neighbor, Gaithersburg (which has been in a land-grab battle with Rockville along their shared border, it should be noted), for taking a better approach, in her opinion. Under Mayor Sid Katz, Gaithersburg has $0 debt, and $65 million "in the bank, earning interest," she said. 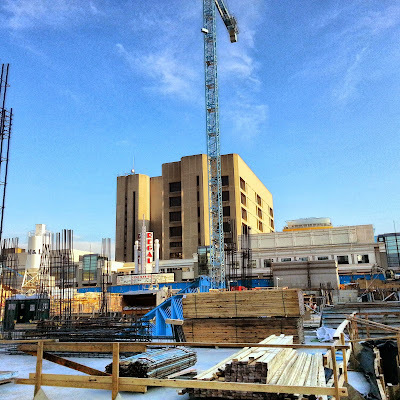 Ironically, Gaithersburg has experienced a real estate development boom in recent years, yet at far lower densities than those at White Flint, or proposed in the Pike Plan draft. Onley and Whitaker also connected with the average working person in the city. 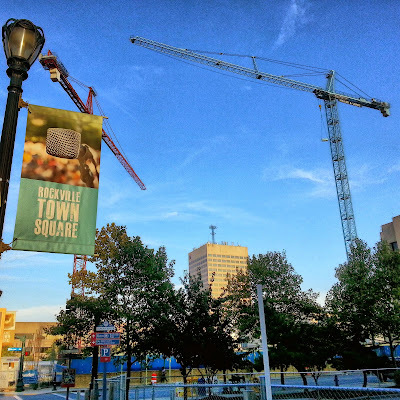 The former noted the misperception that "everybody is rich in Rockville," while the latter recalled her early years in East Rockville, wearing "clothes that were made out of chicken feed sacks." Other candidates made good points as well. Carr pressed the overlooked issue of crime in East Rockville, saying she was surprised to find out 2 police officers were tasked with patrolling that entire area. Newton concurred, and was able to highlight that her work with the Maryland Municipal League resulted in 2 additional officers being added to the city police force. Pierzchala displayed his background in public service and statistical data, with his proposal that the city change the methods by which it measures success in responding to citizen complaints. Feinberg promised she would place a special priority on senior citizen issues, such as the needs of residents who are aging in place. And Moore pointed to his success in advancing significantly more stringent ethics and disclosure requirements for elected officials. One slightly odd element to the debate format, was the seating arrangement, which emphasized that there were two separate factions as if they were political parties, rather than seat candidates in alphabetical order. Hadley drew attention to it, saying the seating "implied divisions that don't necessarily exist." So, no one was knocked out of the race. Hadley, Onley and Whitaker have not necessarily pulled ahead in the race. But I thought they put themselves in a strong position to do so if they build on their performances Thursday in the next debate. That final debate is scheduled for October 22. The Mountain Dew Typhoon Freeze is available for a limited time at Taco Bell. I picked one up, and here is my review, as well as a return by our infamous expert. This special Freeze combines Mountain Dew soda and tropical punch in a frozen slush beverage. 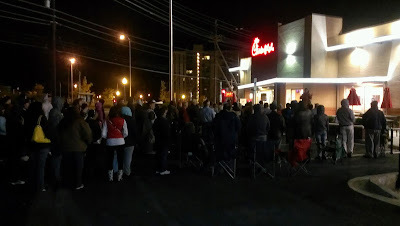 The "First 100" are already in line at the new Chick-fil-A in Montrose Crossing shopping center in Rockville tonight. If they remain in their spots until the Grand Opening at 6:00 AM Thursday morning, they will win free Chick-fil-A meals for a year. This afternoon, 7 alternate spots remained, a sort of waiting list where you could win if one of the First 100 drops out over the night. It's going to be a chilly and soggy one, but Chick-fil-A is providing games to pass the time. 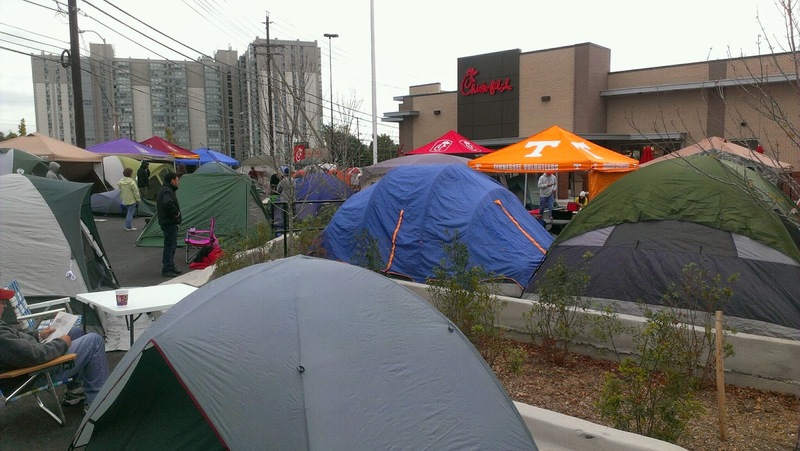 The chain has given $18 million worth of such free meals away at more than 700 Chick-fil-A openings. Montrose Crossing is located at the intersection of Rockville Pike and Montrose Parkway. If exiting from the Montrose Parkway, you will see the restaurant immediately on the right as you rise on the ramp to Rockville Pike. KFC Go Cups are a new way for travelers, commuters, truckers - any hungry person on-the-go - to dine on the highway. Choose one of 5 KFC chicken favorites, add potato wedges, and get a meal that fits in your vehicle cupholder for only $2.49. 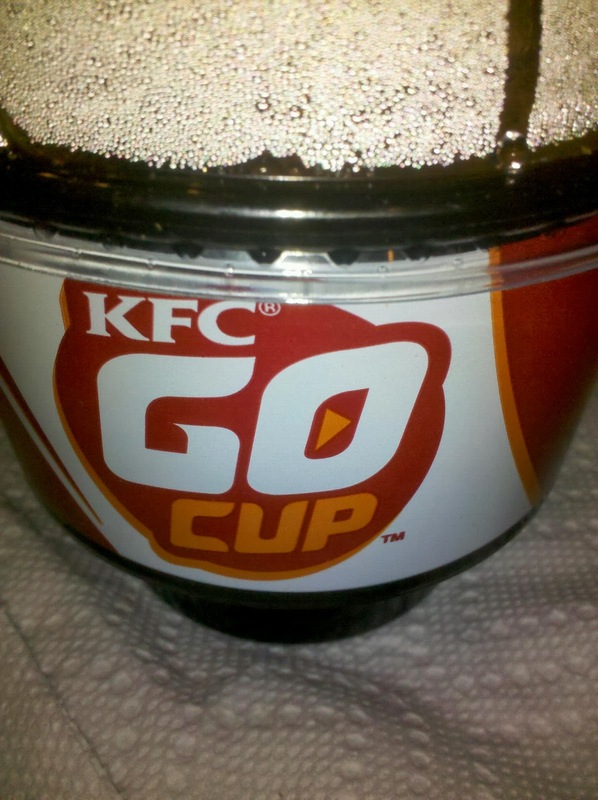 Watch my video for a thorough review of the chicken, potato wedges, and the technology and function of the KFC Go Cup itself. If there's one candy closely associated with Halloween, it would have to be candy corn. Now the classic American candy has joined with the classic American cookie (Oreos). What is the result? Watch my video review, and count down the days until Halloween with the Robert Dyer Channel Halloween Countdown. Love brownies? How about two with a thick layer of fudge cream frosting in between them? And chocolate chips on top of the brownies. Now you're talking! "What Federal government shutdown?" 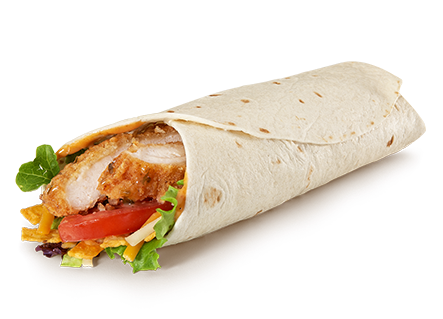 Watch my video for a complete review of Taco Bell's Brownie Sandwich now.